I am in the process of archiving all significant materials that I scanned, photographed or recorded in Bohol on various visits between 2005 and 2011. Archiving is a seriously time-intensive activity but there is genuine relief to be found in assembling hundreds of items from stray hard drives and depositing them for posterity. Call it ‘research closure’. To mark the stages of my progress I intend to do a regular post showcasing a favourite item. 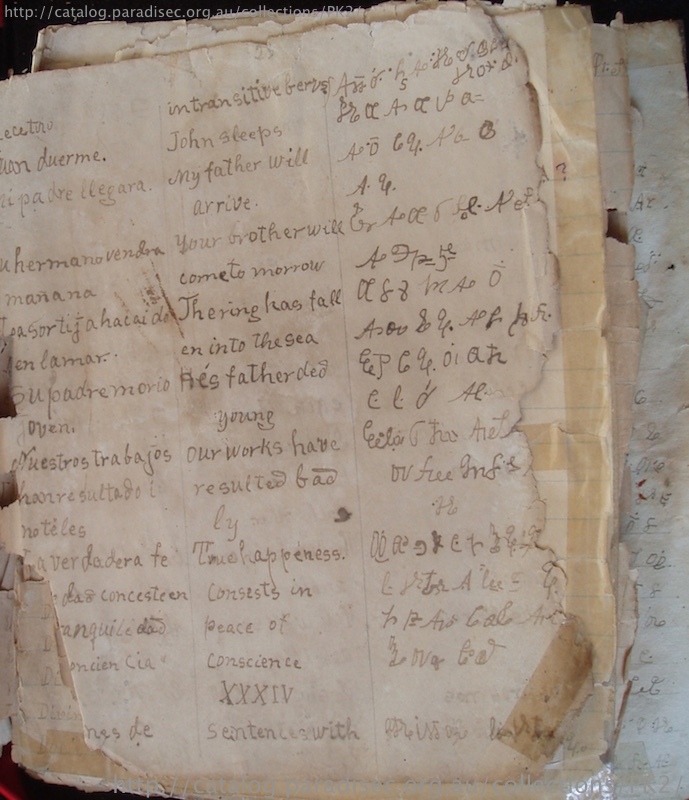 Today, I am introducing the Castañares Manuscript, an extraordinary handwritten document of unknown provenance that used to be housed in the old Bohol Provincial Museum with no explanatory notes. An Eskaya teacher in Taytay suggested that it may have been penned by one Domingo Castañares which is why I refer to it as the Castañares Manuscript. In oral accounts Castañares was one of the chief scribes of Mariano Datahan and church records indicate that he was born in 1912 and died in 1985. His occupation is given as ‘farmer’. Whoever wrote it, it is likely that the scribe was more competent in Spanish than English on the basis of the frequency of copying errors in the English text. The 108 page document is fragmentary and comprises a partial trilingual Spanish–English–Eskayan dictionary with phrases, Visayan language explanations of Spanish grammar, and the text of a Visayan catechism translated into Eskayan. 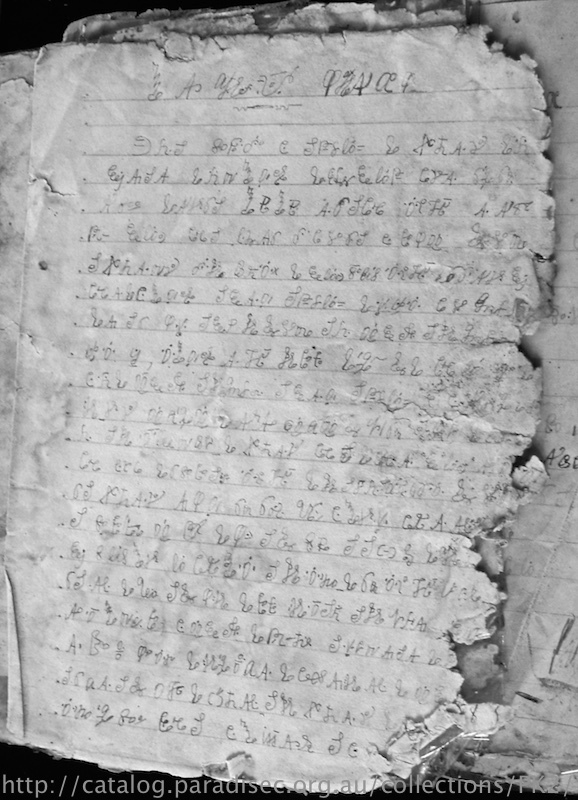 The only ‘original’ text in the document is the material that is in Eskayan; the remainder has been copied from at least three separate published sources. My best guess is that the original source text was a Spanish-era school book for teaching Spanish to Visayan speakers. 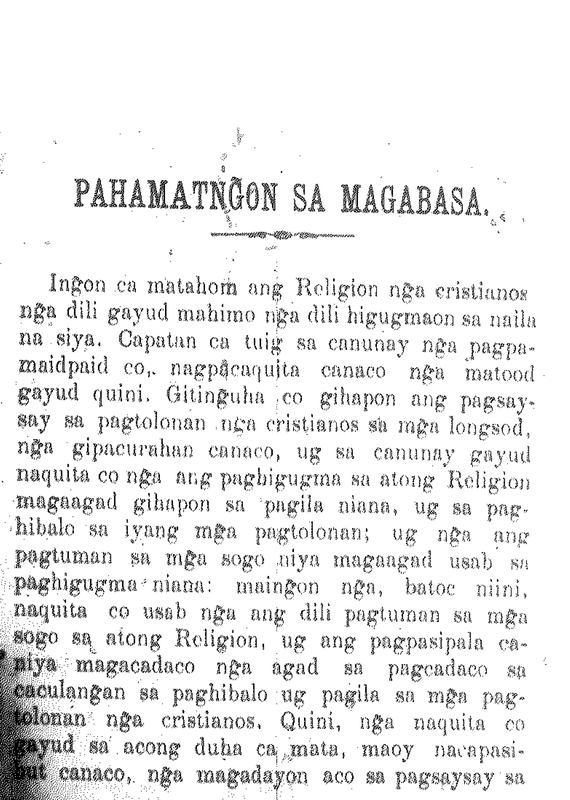 After the arrival of American teachers in 1900, Visayan-Spanish textbooks were modified and republished to include an English column. The practice of modifying Spanish textbooks is specifically attested in Bohol. 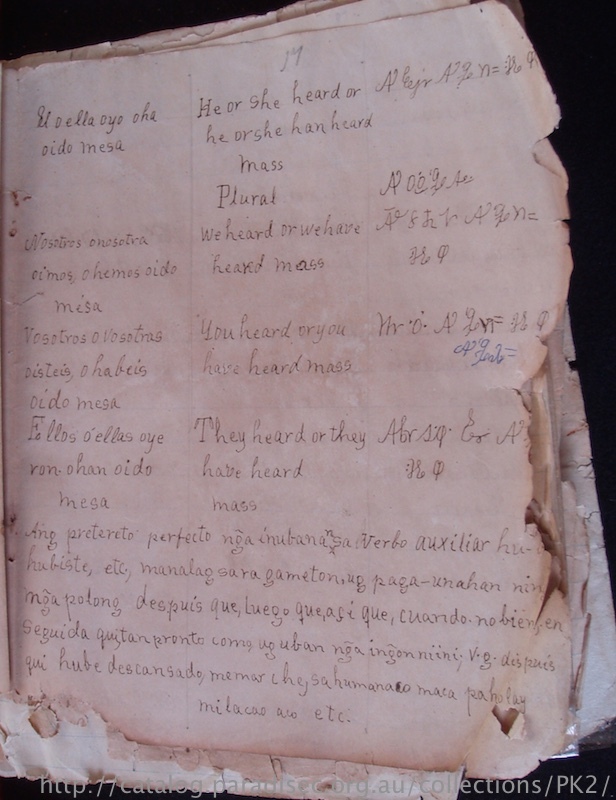 Later, it would appear that an Eskaya scribe recopied one of these modified textbooks into a notebook and replaced all Visayan text with Eskayan. The end result is a kind of palimpsest in which evidence of the two preceding texts is preserved. 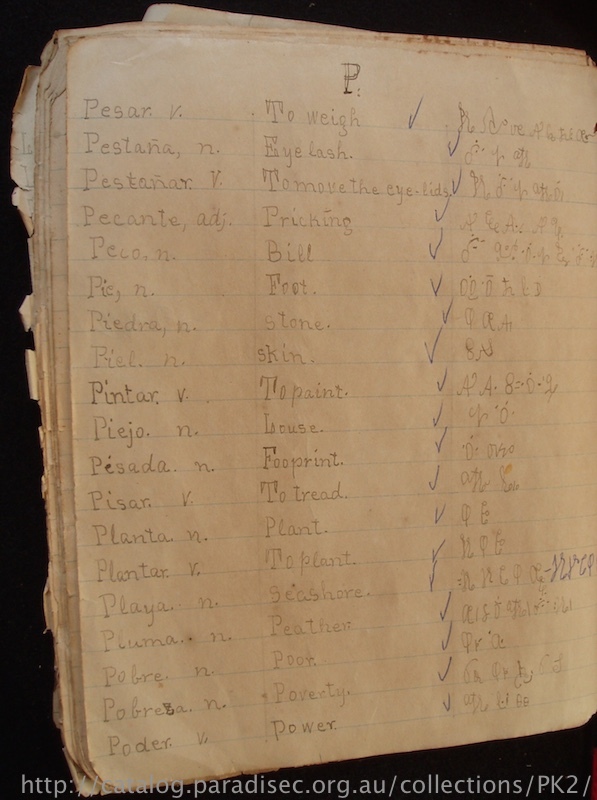 Note grammatical explanations of Spanish in Visayan, evidence of the earlier Visayan–Spanish text from which two later texts were derived. I have tried for years to find the two language texts that form the basis of the Castañares Manuscript, searching across archives in Manila, Canberra and Washington. If anyone can help me out, please do. 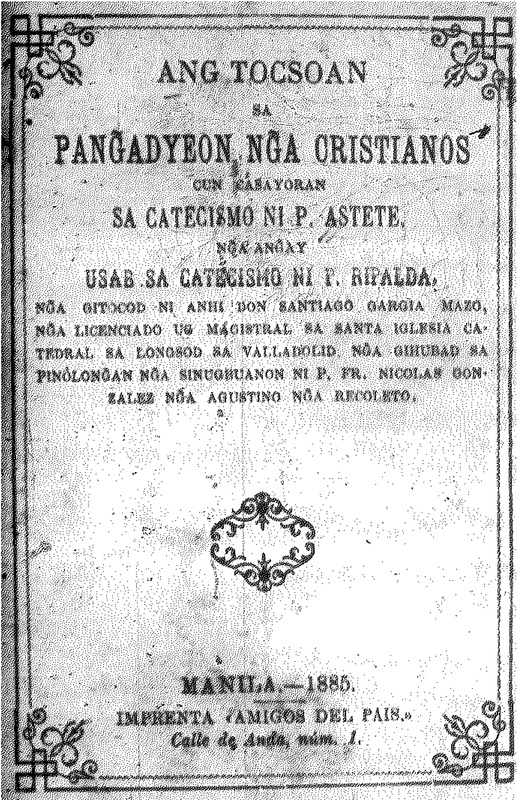 The same notebook has evidence from a third text which can be identified as Fr Gaspar Astete’s 1885 catechism Ang tocsaon sa pangadyeon nga cristianos. I had somewhat more luck locating this on microfiche in the National Library of the Philippines. And here is the Castañares translation of the foreword above, Pahamatngon sa Magabasa ‘Advice to the reader’. It’s hard to say just how old the Castañares Manuscript is. In her 1993 thesis, Cristina Martinez supposed that date 1885 referred to the date of the notebook itself, not noticing that it was simply handcopied from the frontispiece of Astete’s catechism. 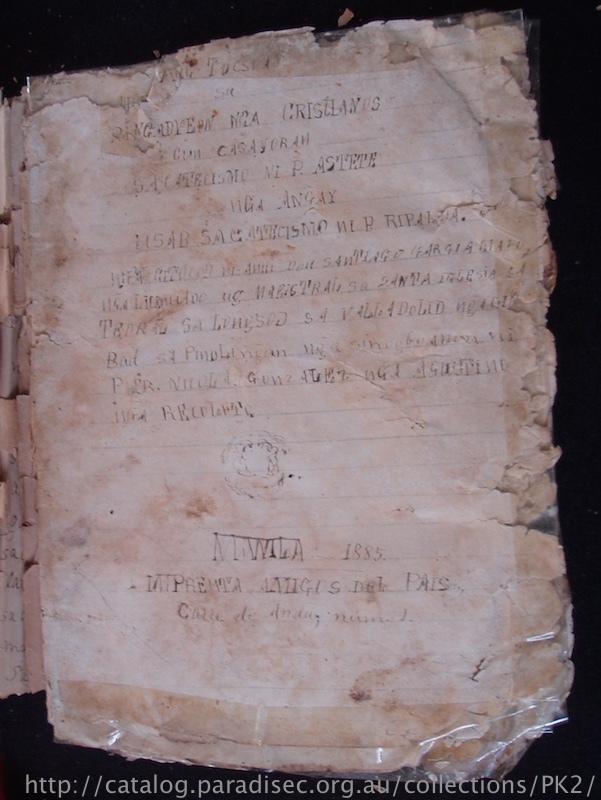 My best guess is that the Castañares Manuscript was produced some time after 1902 when the Thomasite teachers established themselves in Bohol following the Boholano-American war. From my linguistic analysis of Eskaya literature, I hypothesised that examples of Eskayan lexemes did not emerge in writing until the late 1920s or early 1930s. If Domingo Castañares really was the scribe, this later time period would be more plausible. 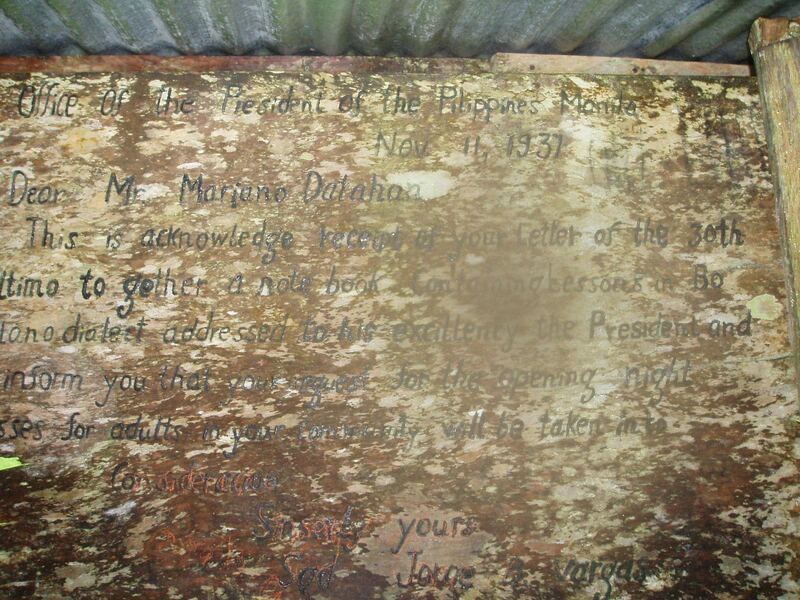 It’s also possible that this is a version of the notebook sent to President Manual Quezon in 1937, as recorded on this wooden signboard from Taytay.